I would watch a whole show of Conan O’Brien and Jordan Schlansky traveling to different locations around the world. I love those segments on Conan. I was particularly excited to see that Conan recently took a trip to Japan. I studied abroad in Hiroshima in high school and then in Kyoto in college, so the country and its people are very close to my heart. My hope was that the videos would be funny, of course, but that they would also represent Japan in non-stereotypical ways. You can find niches in any country, but they’re not really representative of the vast majority of people in the country. So today I’m going to rank–in my opinion–the authenticity of the Conan in Japan videos from least authentic to most authentic. I’ll say up front that I found ALL of these videos to be funny, and I understand that they were filmed with the intent of making people smile (just hopefully not at the expense of Japan). I should also note that the last time I was in Japan was 2002, so it’s possible that significant elements of the culture have changed since then. 6 (least authentic). Conan’s Japanese Etiquette Lesson: While I found this segment very amusing, and I’ve certainly interacted with a variety of characters and personalities in Japan, the etiquette instructor seemed much more like a comedian than someone who teaches Japanese etiquette for a living. In fact, I’m not sure if the actually imparts any wisdom about proper etiquette, despite numerous opportunities to do so (like when she exchanged business cards with Conan). 5. Conan Rents a Family in Japan: This seems like a classic example of the producers finding a niche within a niche and exploiting it for comedy. Apparently there are services in Japan that let you rent family members to counteract loneliness. The suicide rate in Japan is quite high (ranked 14th in the world), so I admire creative approaches to the issue. The rental service just wasn’t exactly a quintessential Japanese experience to show on TV. 4. Conan Hits the Streets of Japan: This clip starts off very authentic, with Conan trying out some of the interesting things you can find in vending machines in Japan, but it veers in a very niche direction when he talks about “kawaii style” (cute style). Granted, cute culture is huge in Japan, but to take it as far as the people in this clip can lead to social outcasting (which is unfortunate). 3. 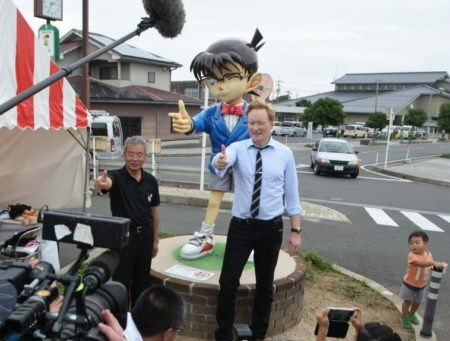 Conan Visits Conan Town in Japan: The main premise of Conan’s trip to Japan was to go to Conan Town (not named after Conan O’Brien). This video jumps around to a bunch of different people and scenes, and I think the scenes of crowds rang particularly true. The crowds weren’t particularly big (Japan has its own celebrities, and Conan isn’t one of them) and they’re dotted with Americans (a good reminder that other people live in Japan too). 2. Conan & Jordan Share a Kaiseki Meal: There’s a moment in the video where Jordan points out that the server is just politely laughing at Conan (not actually favoring him over Jordan), and he’s exactly correct. The meal is also quite authentic, with the exception that it’s not common for people to eat at this type of restaurant, as it’s quite expensive (I’ve eaten at one such restaurant, and even though I wasn’t paying, I’m pretty sure it’s one of the most expensive meals I’ve ever had). 1 (most authentic) Conan & Jordan Visit the Toto Toilet Showroom: Two elements of this video are very authentic. One, they feature some pretty incredible toilets that are extremely common in Japan–these aren’t novelties like they are here. Two, the Japanese man in the video acts exactly like a Japanese businessman would act in this situation (unlike the etiquette instructor): polite, a little confused, professional, and patient. Those are my thoughts on Conan in Japan! What did you think of the series? This entry was posted on Tuesday, December 4th, 2018 at 8:56 pm	and is filed under Japan, television and tagged with television. You can follow any responses to this entry through the RSS 2.0 feed. I finally had a chance to view these videos. Thank you for curating about a half hour worth of Conan…great stuff!